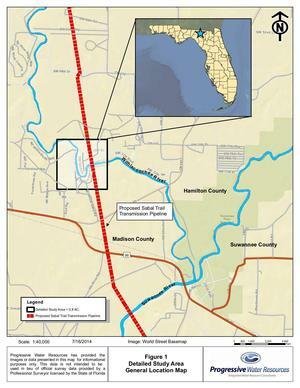 Lori McCraney of Suwannee Alliance for Sustainable Growth wrote in the Suwannee Democrat 11 September 2014, Guest commentary — Is the Sabal Trail pipeline necessary? I am pleased that the Hamilton County Board of Commissioners has issued a resolution challenging the location of the Sabal Trail pipeline in the vicinity of the Withlacoochee River. Hamilton County resident Chris Mericle did an excellent job of explaining the risks of locating the pipeline in such fragile karst terrain. Sable Trails LLC quickly responded by saying that it will move the crossing to the west, possibly crossing the Suwannee River somewhere near the Suwannee River State Park. The SRWMD recommends that the proposed pipeline route be modified to avoid highly sensitive water resource features, karst topography, and the unconfined drinking water source (the Floridan Aquifer) within the district. The pipeline route runs far beyond the district, through the extensive Florida Springs Protection Area (mapped by the Florida Geological Survey) in northern and central Florida. Excavating a six foot wide, seven foot deep trench through the unconfined aquifer (unprotected from surface water runoff and contamination) could cause sinkholes and threaten the sole source of drinking water and the soul source of spring discharge along its route. Affected landowners will forfeit the use of a 100 foot wide easement across their properties. A natural gas compression station is also planned for Suwannee County as well as other Florida counties. This is where natural gas will be compressed and cooled. Water and contaminants are removed in this process, creating hazardous waste. Water for testing pipeline integrity will come from the aquifer, will be contaminated in the testing process, and must be handled as hazardous waste, not injected back into the aquifer. Natural gas is highly explosive, and carries contaminants that corrode pipelines. The parent company of Sabal Trail, Spectra Energy, has a terrible safety record. Spectra Energy has been fined over $15 million for pipeline spills at 89 sites, and is responsible for over $8 million in property damage. 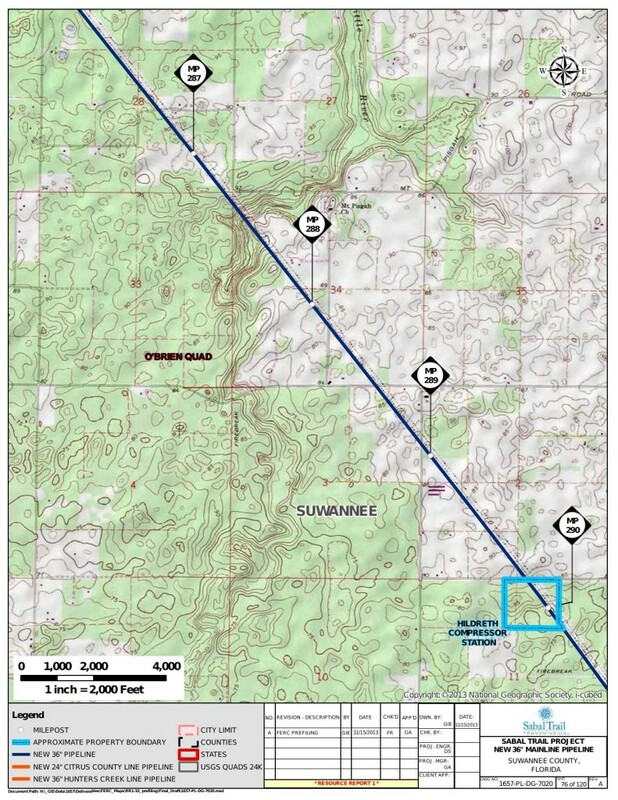 The EPA asked why another 36-inch-diameter line is needed so soon after this one just built three years ago, and also said Sabal Trail has not provided documentation nor sufficient information to show a need for the additional diversity and reliability cited. FPL recently estimated that in 10 years Florida’s demand for power will increase approximately 13 percent. But the Sabal Trail pipeline would increase current delivery capability by 33 percent. What would FPL do with the remaining 20 percent? Power companies do not buy and store fuels for future use, they use it or sell it for a profit. So, FPL could sell the excess supply to natural gas exporters who are poised to export liquefied natural gas (LNG) to Europe and Asia. American manufacturers are opposed to exporting LNG. This would drive up the price of domestic natural gas as jobs and consumer benefits are sent abroad along with the fuel. This could reverse the current trend of manufacturing companies retuning to America. The costs of building new gas-powered energy plants, with a Florida PSC-guaranteed Return of Equity averaging 10.5 percent, will be charged to power company customers. The cost of the Sabal Trail pipeline will be fully recovered via the fuel surcharge on customers’ bills. Publicly traded utilities have a fiduciary responsibility only to their shareholders, not to their customers or to Florida’s citizens. These utilities have everything to gain and nothing to lose, so plants and pipelines will be built whether they are truly needed or not. The standard argument for the pipeline is that it will be good for Florida’s economy, and our local and state representatives are lulled by the vague promise of jobs and tax revenues. But where are the detailed statistics to back up these claims? Pipeline construction jobs are not guaranteed for Florida’s workers, and permanent Florida jobs will likely be limited to a few dozen. These energy projects are given significant tax breaks by the federal government, so American taxpayers will take up that tax burden. Recent studies have challenged the popular theory that fracked methane (natural gas) is a sustainable fuel for the future. About 10 percent of fracked methane gas escapes into the atmosphere as it is extracted. Fracking uses enormous amounts of water and contaminates groundwater. Methane is a greenhouse gas that is 86 times more potent than carbon dioxide. This negates its benefit as a bridge fuel to renewables. Alternatively, renewables are making great strides in providing zero-emissions, affordable energy for our future, and should be the top priority in our nation’s energy plan. Why invest billions of dollars in infrastructure for finite fossil fuels that are driving climate change? There is something you can do to affect the outcomes of these critical issues. Call your local, state and federal representatives and demand a smarter course to a clean energy future. The voices of citizens, when resounded together, can have an impact. The Sabal Trail pipeline can’t be built without approval of the Federal Energy Regulatory Commission (FERC). You can use FERC’s e-comment system ( http://ferc.gov/docs-filing/ecomment.asp) to contact them directly, and anyone who registers there can see all comments. Or you may send e-mail to efiling@ferc.gov, or call 202-502-8258, or mail written comments to: Kimberly D. Bose, Secretary; Federal Energy Regulatory Commission; 888 First St. N.E. Room 1A; Washington, D.C. 20426. Use docket number PF14-1 for the Sabal Trail pipeline. FERC will be taking comments for a limited time before making its decision. Let’s stop the unnecessary and destructive Sabal Trail pipeline before it is too late.